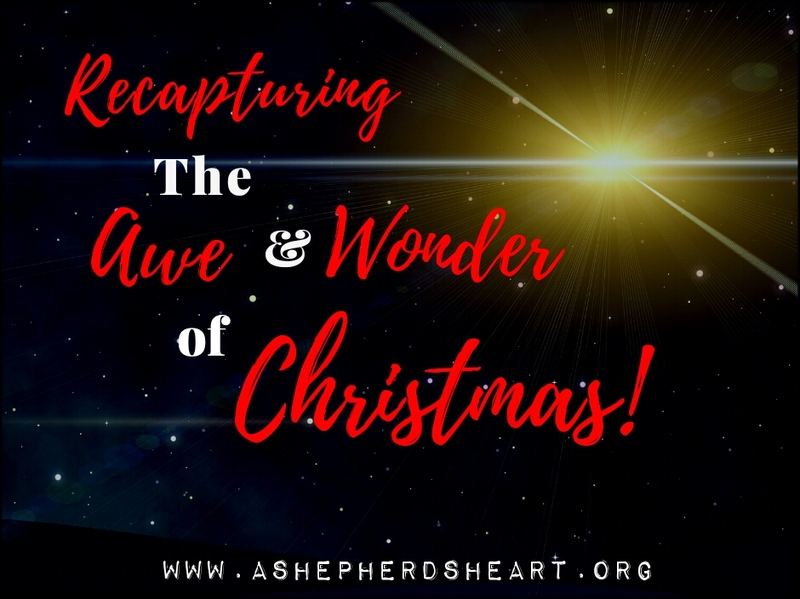 A Shepherd's Heart: Recapturing The Awe and Wonder of Christmas! It's supposed to be the most wonderful time of the year or so the songs say and for some it truly is while for others...it's a very hard time of year for various reasons. Christmas for children can often be sort of a "magical" time filled with fun, awe, wonder and excitement. If you're an adult reading this right now, you may remember those times of life and maybe you've lost that sense of childlike faith, awe and wonder? The truth is that kids don't tend to over-complicate things like adults do sometimes. They don't run everything through "adult filters" whereas we've let many things cloud our vision when it comes to celebrating things such as celebrating the birth of our Savior. Even knowing the truth regarding the true meaning of Christmas from God's Word, we can allow the things of life and even some of the trappings of the season to distract us and steal some of the joy we used to have. My observation is that it can be easy as followers of Christ to become cynical or simply "check out" regarding Christmas which is a time we should be celebrating and proclaiming the gift of Jesus' birth, life, death and resurrection! We should celebrate and share why He came in the first place! It's also true that many young adults / college age people have allowed themselves to become jaded as they begin to see the harsh side of life and realize that it isn't as easy as being a kid was. We've also all heard excuse after excuse as to why Christmas is unimportant or why there's no reason to celebrate it. Things such as "it’s too commercial so I’m not going to celebrate it." Or, the Bible doesn't tell us celebrate Christmas or...Christmas is really just for kids and so on and so forth. The truth is that His birth, His first Advent (coming /arrival) is an integral part of our faith! His entry into this world is significant because He came here in the form of a baby to then live, die on the cross for our sins and to rise again all for you and I! He also fulfilled ancient prophecy foretold in the Old Testament proving God keeps His Word and His promises! Also, other than the super commercialistic push that can tend to come along with the season, the other things, the decorations, songs and festivities only add to the season and aren't harmful. My encouragement to you is (that while we do age and hopefully also grow in wisdom and knowledge) to never lose that Childlike faith! It's time to recapture the awe and wonder of Christmas again my friend! We as followers have a great hope...THE greatest Hope in Jesus! Christmas encompasses this hope for us in a tremendous way. So how do we recapture some of that awe and wonder? 1. Get back to the basics. Important things like reading The Word to revisit all He's done for you and all you have to celebrate each Christmas and all year through! 3. While you enjoy the season, don't let the trappings of the season get in the way of you celebrating the true meaning of Christmas. 4. Maybe consider making a birthday cake for Jesus. While it may seem simple or trivial, it just might get your mind set on the reality of His birth you're celebrating during Christmas! 5. Go celebrate via a Christmas concert and a Christmas Eve Candlelit service to bring in Christmas day! 6. Consider adding some of the traditional elements back into your celebration like celebrating advent as part of the Advent / Christmas season. 7. Choose to see the blessings and positive things that come along with the season! Choose to refresh your mind and view on Christmas all together! 8. Seek opportunities to serve others this Christmas time. Give them the gift of your time, talents, skills and resources as you seek to be the hands and feet of Jesus! As you study His Word, and approach the Christmas season each year, may you sense the joy, awe and wonder anew regarding what Jesus has done for you as He entered this world as a baby born in a lowly stable. You and I cannot ask for a better Christmas gift than knowing Jesus Christ and experiencing His love and forgiveness for ourselves!